Gray water is wastewater from homes that comes from bathing and washing clothes. Gray water does not contain food waste, human waste, toxic or hazardous substances, or water softener backwash water. Gray water can be reused and recycled in Ohio with a permit from the local health department (Ohio Administrative Code 3701-29-17). Recycling is allowed in both rural areas and in cities, even if a sanitary sewer system is available. Because gray water does contain some dissolved organic matter, if held too long, it becomes anaerobic and starts to smell bad. Gray water should be dispersed within a few hours to prevent odors. 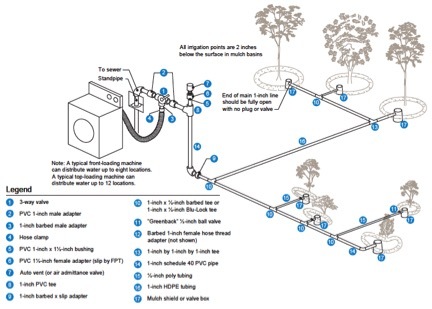 Type 1 gray water reuse systems take water from one fixture in the home and direct it to a subsurface irrigation system in the yard (Figure 1). Wastewater from just a washing machine or just a shower keeps this system under 60 gallons per day. The wastewater is largely untreated, but a filter is recommended to capture hair, fiber and other debris to protect the irrigation equipment from clogging. Type 1 systems are designed for subsurface irrigation during the growing season. Therefore, a diversion valve connecting the system to the home septic system or public sewer is required. Piping, tubing or flexible hoses disperse the wastewater below the ground surface by gravity. All pipes and fixtures conveying gray water must be purple or marked with a purple stripe and be labeled “Nonpotable water, do not drink.” Four inches of mulch or compost can be used to cover the pipe if the water is used to water lawns, gardens, trees and/or landscape planting. The soil beneath a Type 1 gray water reuse system must be unsaturated during the growing season. It must be at least 12 inches deep over a limiting condition of bedrock, compacted glacial till, sand and gravel, or other limiting conditions. In Ohio, gray water application should be limited to 1 inch per week. For 60 gallons of gray water per day, a minimum of 480 ft2 irrigation area is needed. For example, applying water in a 6-foot radius circle around a tree, 60 gallons of gray water is enough to water 4 trees. Figure 1. An example of a Type 1 gray water reuse system. Source: Clean Water Components, sfwater.org/modules/showdocument.aspx?documentid=55.